Leona J. (Peters) Pisacka was born on November 25, 1910. 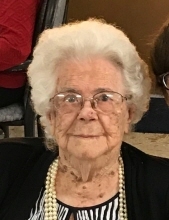 Leona passed away September 10, 2018 at Pioneer Manor Nursing Home. Leona was the ninth of ten children born to William H. and Elizabeth (Schmidt) Peters. Leona was born on her parent's farm south of Hay Springs. Leona went to school at District 30 through the 8th grade and then graduated from Hay Springs High School in 1929. After high school Leona's first job was working in a confectionary store owned by her brother Francis and their cousin Lawrence Peters. In 1940 Leona passed the Civil Service Exam and then became a clerk at the Hay Springs Post Office. Leona continued her post office job until her retirement in 1970. Leona first noticed Henry Pisacka while in the 8th grade. They were both at the movie when they started flirting with each other. They dated on and off for the next 17 years. Hank entered the military in March of 1942. While home on leave in an early morning ceremony and before Hank was deployed, they were married on December 5, 1942. Hank was a rural mail carrier for more that 38 years. Hank passed away in 1984. Hank and Leona loved outdoor activities. They camped, fished, traveled the states and where avid rock hounds. Hank was sometimes known as Kingfish, but often times Leona would out fish him. They had an extensive collection of agates and Indian artifacts that they found in northwest Nebraska and southwest South Dakota. Leona lived her entire 107 plus years in the Hay Springs area. She has lived the past few years at Pioneer Manor, first in the assisted living area where she could maintain much of her independence and later in the Nursing Home under the watchful eye of their staff. In addition to her husband Henry, Leona was pre-deceased by her parents and her nine siblings, Joseph W. Peters, Martin P. Peters, Anthony J. Peters, Albert F. Peters, Wilhelmina M. (Peters) Davis, Ester E. (Peters) Blonien, Francis A. Peters, Kathryn J. (Peters) Scott, and Edna C. (Peters) Tulloss. Services for Leona will be held on Friday, September 14, 2018 at 2:00 at St. Columbkille Catholic Church with Chamberlain-Drabbels in charge or arrangement. Memorials may be left to benefit the Hay Springs Fire Department or to Pioneer Manor Nursing Home.